Being surrounded by all of your clothes as you drift off to a peaceful slumber really kicks up that urge to pare down, especially with the whole New Year thing. It has been a couple of months since the closet’s contents took over the bedroom as we emptied the space to work on it. The carpet has already been ripped up, the terrible subfloor repaired, and new solid oak flooring put down. I’ve also removed the old sheet mirror from the sink nook and have made progress on those crumbling plaster corners. (They’re so much better! I scrapped the corner trowel and just did one side at a time. Far easier technique.) One spot needs a touch more work, but I’ll wait to mix up another batch of mud. There are new holes to come, hopefully as soon as this week, when new wires will be fished through. One of the electricians was working on pulling a whip from the closet today, and she lowered the ceiling fixture to get a better look at the wiring in there. The house is 125 years old and it has been updated in bits and pieces over the years, so some areas are all right but the closet doesn’t look like one of them. Paper covered wires (plus a few modern wires spliced in, temporarily). 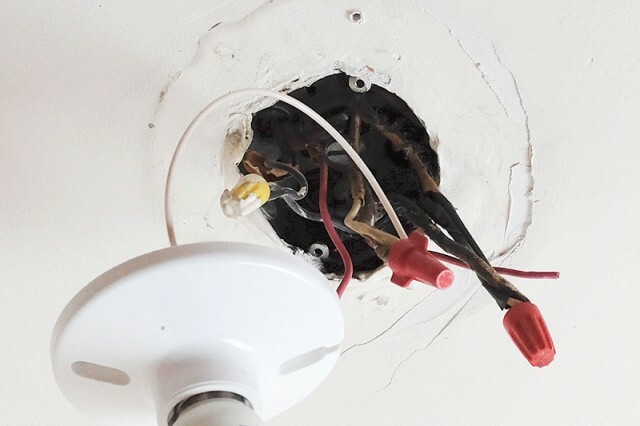 This, by the way, is the only type of wiring I’m ever confronted with when changing a light fixture. What a crazy day it will be when I go to put up a new light and the colored wires will match what the instructions tell me to do! Once the rewiring is done in there, I can get in patch the new holes that are being made. Since the ceiling needs to be accessed anyway, I’m taking the opportunity to move the light over about six inches and center it. More patching will of course mean more sanding, which means more fine white dust everywhere, but then it will finally be time to wipe down the walls, prime, and paint. The walls and ceiling will both need it. Is that everything? I think it is. I worked with the 3D rendering I’d made again, playing around with the best way to organize our closet. There’s only one long, straight wall that makes sense for most of the clothes, but I thought that a mix of double hanging (what we had) and shelves would be more useful. And if we could get our floor length mirror in a different spot, it would free up space on the only other straight wall for additional storage. The Sarah Storage collection looked like a perfect fit so I reached out to Ballard Designs and they’ve sent a few pieces over. They’ve already arrived and I’m pretty excited about them, but they’re hanging out on the first floor until the closet is far enough along to bring everything up. Such a funny layout, but it’s going to be so great when it’s all put back together again! I love watching the progress of your house – your closet is going to be amazing, I can’t wait to see it! Who gets the private sink? I can see my husband drooling over having his own special room called the Man-Shave. Putting things back into the dabric of the building is always so exciting. Congrats. “The Man-Shave!” Ha! It has kind of become my sink. Brandon’s not barred from it or anything, but I guess he likes the bathroom instead? I wash up for the night there and get ready each day at that sink — or at least I did until we started tearing it up. I’ll be back to using it again once the closet is further along. 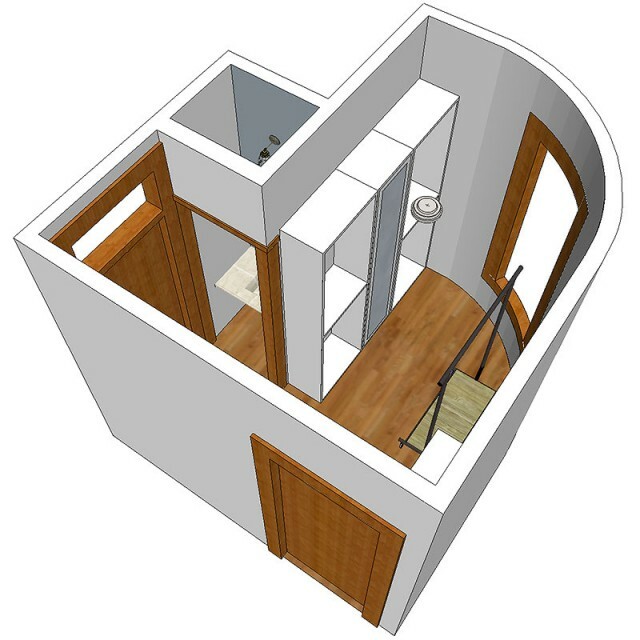 The layout of your closet is awesome, I like the storage you’re going to put in! 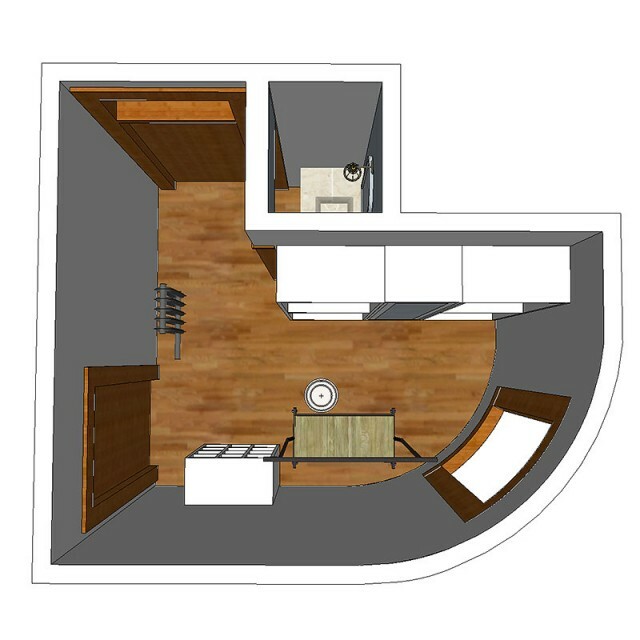 Question … I do not know the layout of the surrounding bedroom/hallway. But, do you need both doors going into the closet? If not, you could get rid of one and have more straight/90 degree wall space! We could, but the one that’s less frequently used is the one by the sink and it’s kind of a tight spot to add more permanent storage there. That little section is where we keep a laundry basket. It blocks the door when it’s there, but then we can scoot it over easily enough if we wanted/needed to. Plus the kids think the closet is a secret passage! Can’t get rid of that. Gotcha … yea, the only door that makes sense to omit would be the one you use most frequently. I love kid’s imaginations, ha! Great progress, Nicole! Would you ever consider doing a post detailing exactly how you handle the plaster patching and repairs? Seems like almost everyone in blogland has lovely new sheetrock! second this! 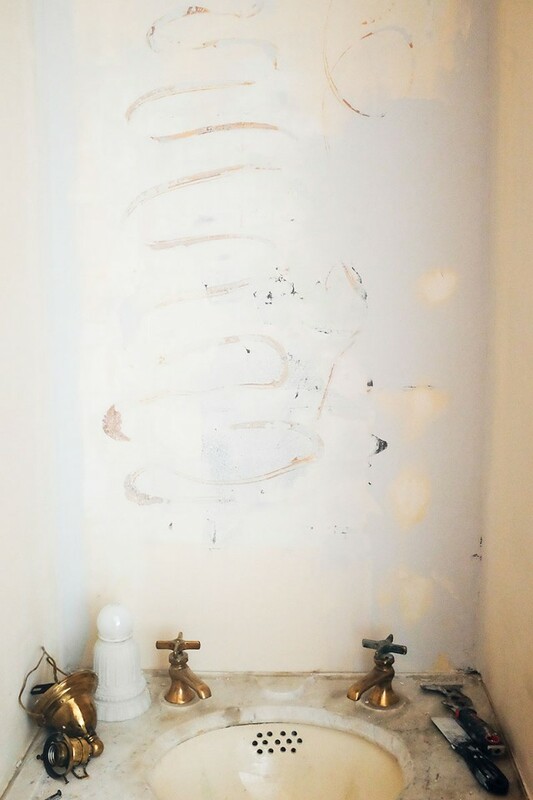 I just moved into a cute little 1920’s colonial/craftsman hybrid and I have no idea what to do with plaster walls! I want to make some changes, but I’m afraid. I would love a tutorial about how to repair it and how you sqaured those corners, since I’m going to have to do the same. 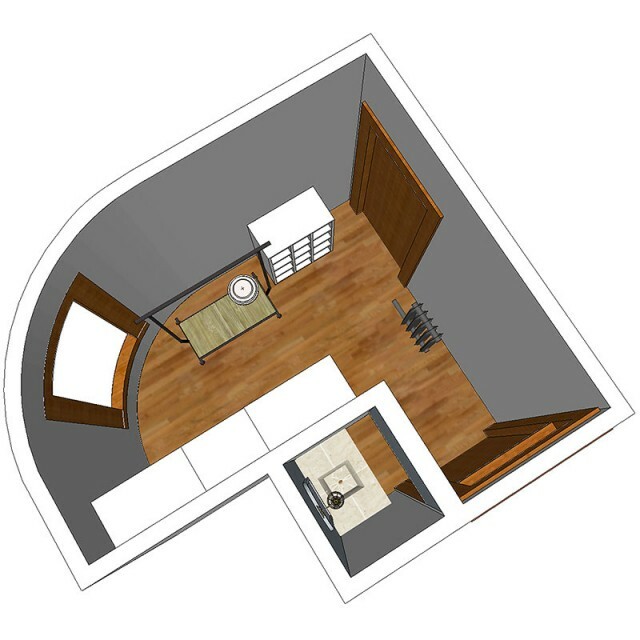 Been watching for your closet posts as we are doing something similar in our smallest bedroom to make a master closet. We ordered two of the Restoration Hardware 6′ Vintage Tailors Racks and I was so excited. Then upon assembling & loading the first up with a few items (barely full) the iron bracket/brace on one end crumbled. Such a bummer. They were fantastic about the return, but we wish they were made better. What did you decide for a hanging rack? We would love something with an upper and lower rod. I love that old marble wash basin. I would have to stand in front of it and imagine myself back back back to that time and how was the person peering in the mirror dressed,and even more what did the marble look like when it was brand new and the house just built and the proud happy family moving in. Was the furniture carried by horse and wagon and did the children run outside to feed it an apple and talk to the burly moving men? I swear I don’t believe in reincarnation but I have such a strange love and excitement for the Victorian Era and all of its grandeur and excess. Oh, I LOVE this. I adore the Victorian Era too! Forgive me if you’ve mentioned this previously, but what program did you use to do your 3D model? 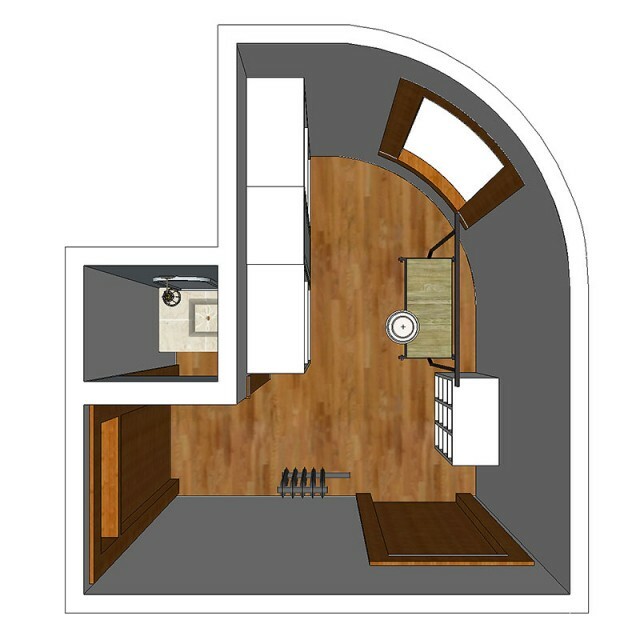 Am struggling with planning a large garage-turned den, and 3D would help immensely. I love that your electrician is a she! My father was an electrician. As the father of 4 daughters, he loved having female apprentices. Not so many, we need more! So, this is an honest question, that, thanks to it being on the internet might read like snark, but it isn’t, I swear. I love reading about organizational changes and stuff, but it stops being relatable the moment I get to you saying that you like this super duper expensive option and you call the company and they are sending some over. There are lower cost options that are just as nice and potentially more functional, but, tell me, what is it about THESE pieces that makes them worth the extra cost? I think I first found your blog years ago because of a PAX wardrobe post you had. It actually influenced my choices in fitting our closet with a similar piece. The Ballard stuff looks nice and all, but, why spend 4-8x as much on those pieces? They didn’t come to you first for a partnership. What is it about those that makes them worth the investment? I get it, and I’m happy to answer! I loved the PAX wardrobe that we put in at the last house. It met all of our needs, offered plenty of customization and storage, and held up well. I did think of going with the same system again, but the depth is too much for the space I’m working with now (23″ deep, versus the 14″ deep of the Sarah system). I also really like the half-height shoe storage piece from Ballard, and the design details. The pieces are also pre-assembled — not a huge deal, since I’m used to building furniture, but a perk. And when looking at the long wall, I wanted to get a mirror over there to free up the other side, and I liked their cabinet with shelves inside and a mirrored door. And the kicker: two full-width cabinets paired with the skinnier mirrored one will fit perfectly along the stretch of wall I’m working with. I looked at systems from other brands as well. Some were less expensive, and some were more, but I reached out to Ballard Designs because they were my top choice. I’m so thankful that they were excited about working with me, too! I wondered the same thing, because 14″ is so shallow. The clothes on hangers will stick out a little! You can see it in photos like this one. The cabinets aren’t meant to have doors, so there’s no need for the clothes to be recessed, or even flush. I like that the units won’t seem as bulky as they would if they were deeper, since it’s a walk-in (as opposed to reach-in) closet. I too have an awkward (though much smaller!) closet in a very old house. And after lots and lots of research earlier this year we came up with a solution that has worked brilliantly for us: retail faceout racks! We went with a combination of waterfall hooks and straight faceout hooks from from Grand + Benedict (great quality, very affordable price and quick shipping!) but there are also custom options (most made from pipe) available on Etsy. 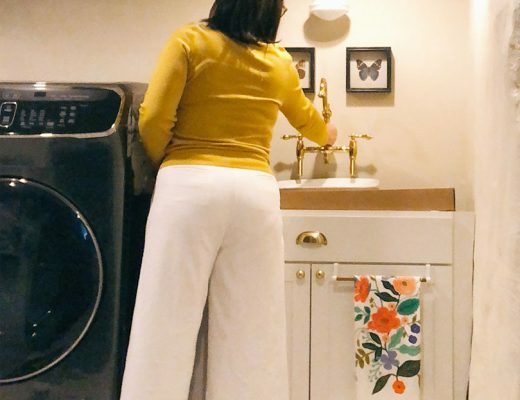 They store ton’s of clothes in a way that makes it very easy for us to find what we need, and hanging multiple face out hooks in our long, narrow closet enabled us to both take advantage of our vertical space and maintain the ‘walk in closet’ feel we wanted. Adding just one or two deep faceout hooks to a large closet like yours would also give a valet hook option–making it easier to set up your wardrobe for the day–or even a week. Or to hang your long dresses out of the way, or just display your favorite pieces. Best of luck with it all! 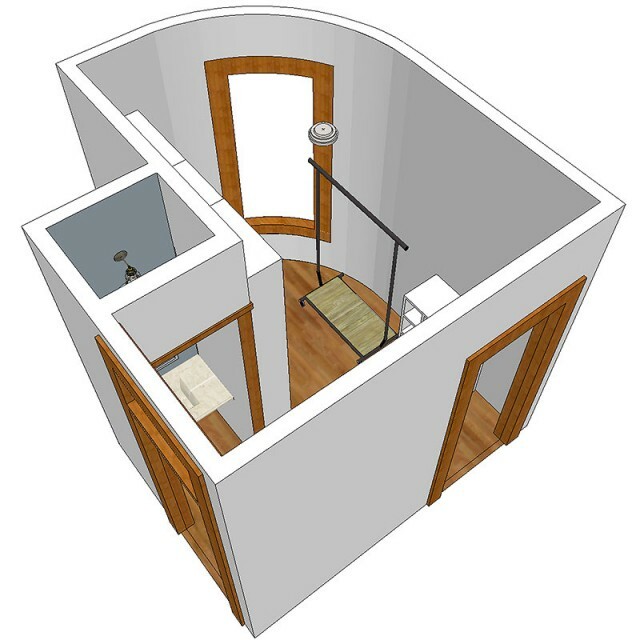 Yes, what is the 3d model software you use….I would love to use it for my next design project. Hi there! 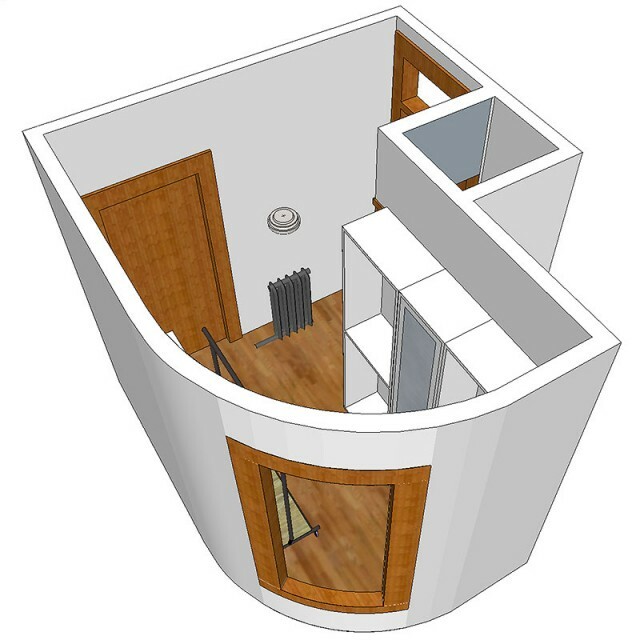 I was wondering what 3d software you used…and is it easy to work with? Thanks! Ohh I’ve always wondered if you ever bought anything from Ballard Designs! I get their catalogue and I love it. So many things in it seem like they’d work with your style.